Right in the center of the sloping but fairly flat island Fornebu, which is positioned at the far north end of the Inner Oslofjord and just west of the city of Oslo, a mighty rock raises itself from the soil. Indomitable granite that forces people to build around it, a rough island surrounded by green. If one clambered on top of it, somewhere between 1939 and 1998, one had a good view of the airplanes landing and taking off from Oslo Airport Fornebu. 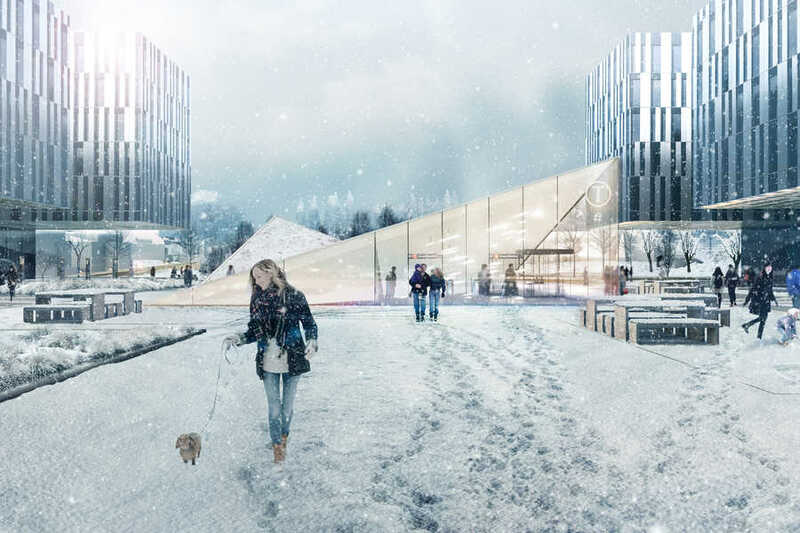 A new airport, Oslo Airport Gardermoen, 35 km north east of Oslo opened in 1998 and step-by-step Fornebu became part of the city. Along the thoroughfares offices of computer and telecom companies were built in American style. Across from the rock is the Telenor Arena, a covered football stadium that also hosts dance events and concerts. Along the craggy coastline of the island with its hundreds of little bays, sought after residential areas arise, offering a splendid view on the fjord and the city. 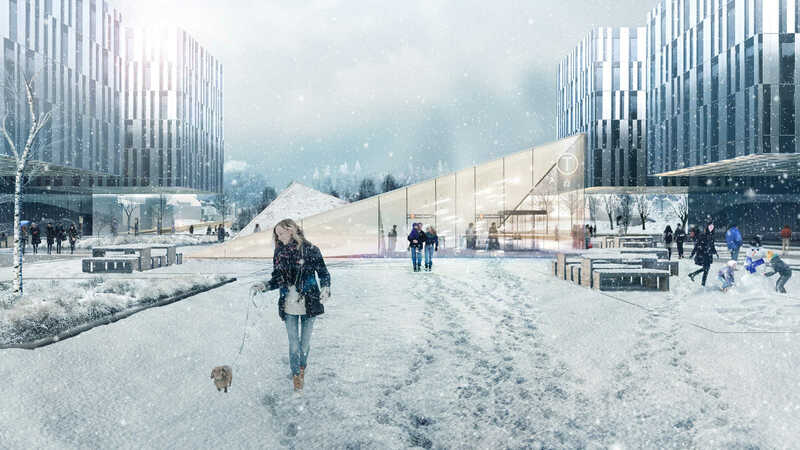 The Arena, the adjacent park with sculptures and the rock itself characterize the context for the planned subway station Arena (later named Fornebuporten), that is part of the new Fornebu subway line with six stops, connecting Fornebu to Majorstuen in the center of Oslo. 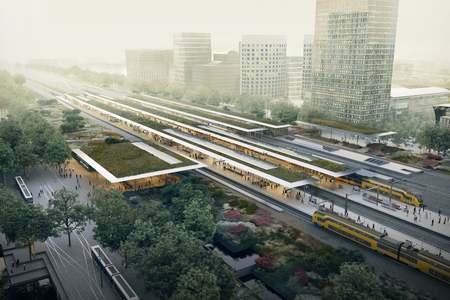 ZJA Zwarts & Jansma Architects presented a design for this station that not only serves the visitors of the Arena, but that is also meant to be used by the people who work and live in the residencies and offices across the street. 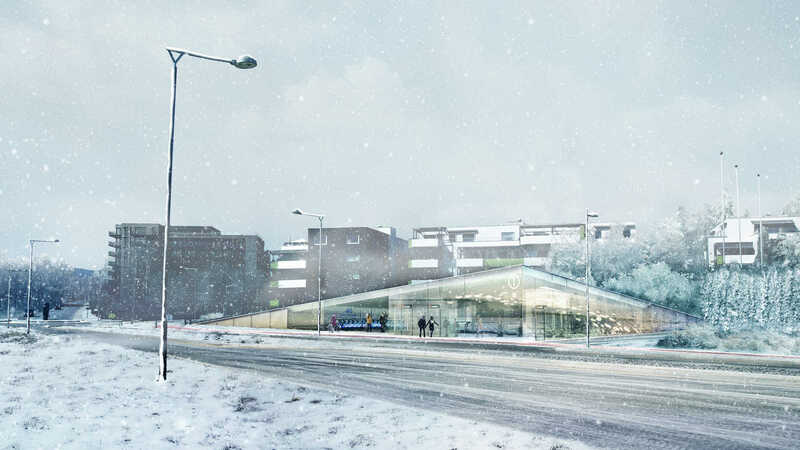 The station has two entrances, on both sides of the rock, and their transparent glass facades make them easily recognizable from a distance, by day and night. 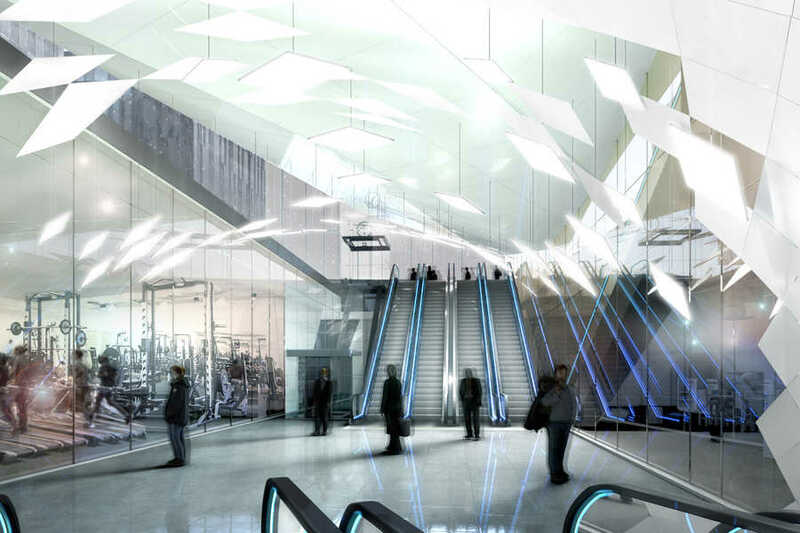 Diamond shaped skylights guide daylight into the underground station. The design underground aims for simplicity, clarity and light. The escalators and lifts are positioned next to each other, there are no columns and the benches are situated right in the middle of the platform. This all provides a calm and safe appearance. 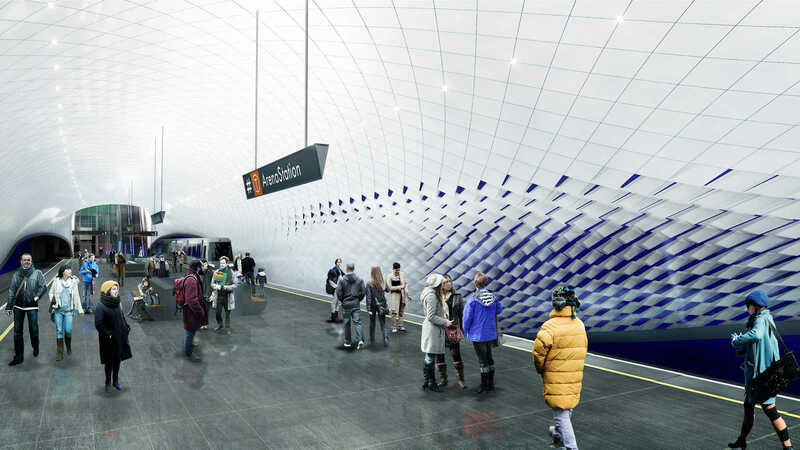 The walls of the station are clad with a curved screen of white diamond shaped elements that will send a rippling effect over the entire wall caused by the airflow across the walls whenever a train approaches. When they move, the ultramarine surface behind them lights up through the openings. 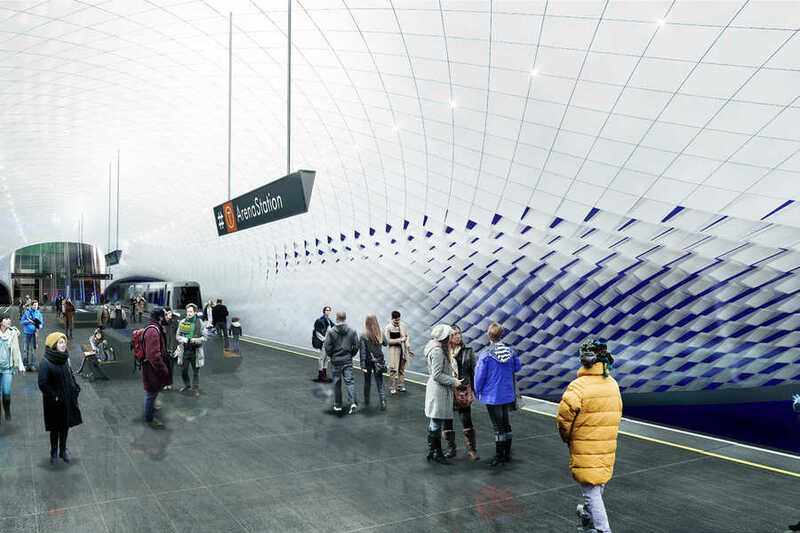 It is the breath of Njord, the god of the north wind, racing out in front of the approaching train, transforming the inside of the station into an enormous kinetic sculpture. 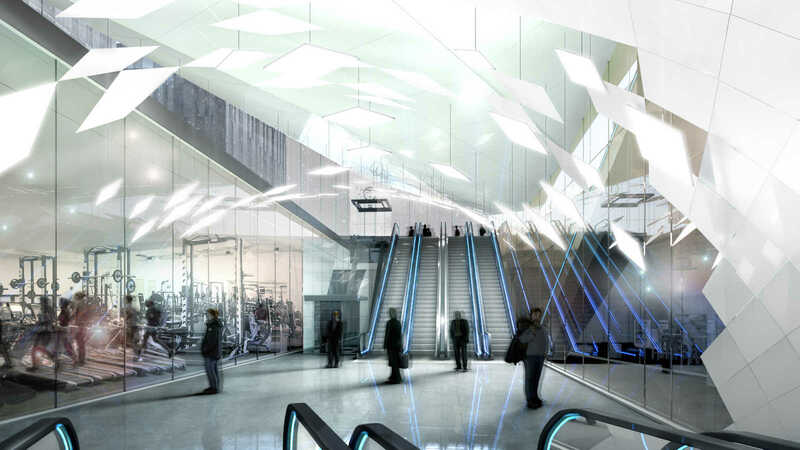 This reference to the park with sculptures and the daylight entering both sides of the station enhance the link between the world above and underground. 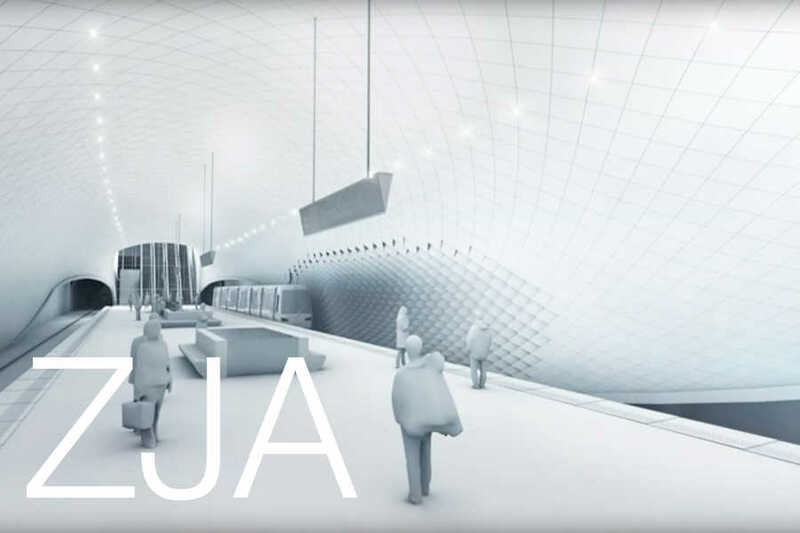 In this ZJA design the roofs of both entrances are triangular and green. The pointed ends stand at an incline. Seen from the apartments across the street, this nearby green addition covers the view of the intersecting road to a large extent. In doing so it provides a visual connection with the rock and the park with sculptures. The green landscape around the station remains intact as much as possible. 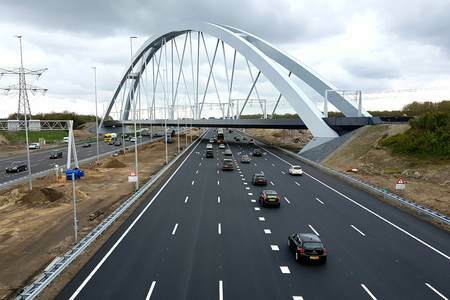 The south entrance is designed to accommodate the large crowds visiting the Arena, and to lead them to the subway as smoothly as possible without congestion. The connection between the park, the entrance to the parking garage, the shops and the subway station is broad in its layout. When arriving here from the city, having seen the breath of Njord touching the walls and reaching the surface, the first thing one sees is the rock and the Arena. 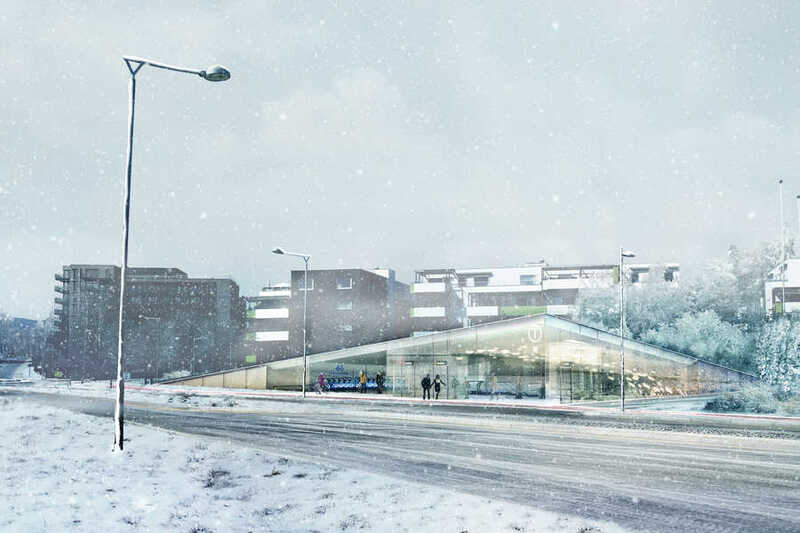 This is a subway station, with a character of its own, that above and underground, both functionally and esthetically, connects with the genius loci.